The Motley Fool Canada » Dividend Stocks » Which Is the Top Rail Stock to Buy Now? Which Is the Top Rail Stock to Buy Now? The Canadian rail stocks have delivered market-beating, double-digit long-term returns. Since late 2007, the stocks of Canadian National Railway (TSX:CNR)(NYSE:CNI) and Canadian Pacific Railway (TSX:CP)(NYSE:CP) have delivered annualized total returns of about 15% and 13%, respectively. It may be difficult to choose one over the other because both companies have done very well over the long term. Looking at their valuations and dividend history should help you decide on which to buy today. Which rail stock is cheaper? Canadian National Railway just dipped more than 10% from its recent high. At $102 per share as of writing, the company trades at a price-to-earnings ratio of about 18.6. The company is estimated to increase its earnings per share by roughly 10-11% per year on average over the next three to five years. So, it trades at a PEG ratio of about 1.77. Analysts from Thomson Reuters have a mean 12-month target of $121 on the stock, which represents near-term upside potential of about 18%. Canadian Pacific Railway also dipped about 10% from its recent high. At roughly $247 per share as of writing, it trades at a price-to-earnings ratio of about 17.5. The company is estimated to increase its earnings per share by roughly 16% per year on average over the next three to five years. So, Canadian Pacific Railway trades at a PEG ratio of about 1.09. Analysts from Reuters have a mean 12-month target of $314 on the stock, representing near-term upside potential of about 27%. Based on their near- and longer-term growth potential, Canadian Pacific Railway is the cheaper stock. Canadian National Railway has increased its dividend per share for 22 consecutive years with a 10-year dividend growth rate of 14.7%. Its quarterly dividend per share is 10.3% higher than it was a year ago. The dividend is very sustainable with a payout ratio of about 33%. Over the next few years, Canadian National Railway has the ability to increase its dividend by about 10% per year on average. Shareholders can look forward to a dividend hike next month! Canadian Pacific Railway doesn’t consistently increase its dividend. However, over the course of 12 years, it has increased its dividend per share at a compound annual growth rate of 11.7%. Its quarterly dividend per share is 15.6% higher than it was a year ago. The dividend is very sustainable with a payout ratio of about 19%. Total returns investors should consider Canadian Pacific Railway, which is more discounted. However, if you like consistency, you should buy Canadian National Railway on the dip. CP Average Diluted Shares Outstanding (Annual) data by YCharts. 10-year share count reduction of CNR and CP. 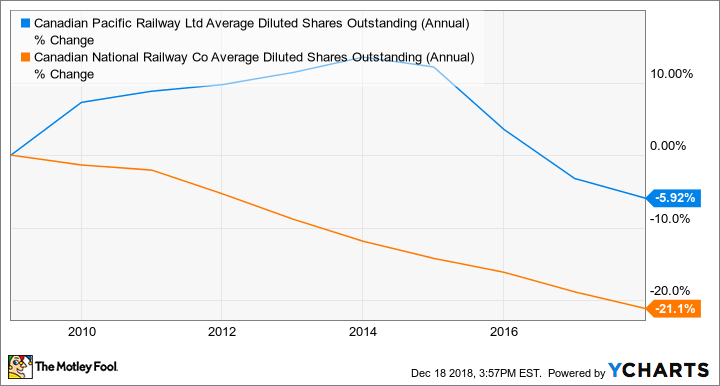 You can expect Canadian National Railway to continue increasing its dividend and reduce its share count over time, thereby increasing your stake in the company. The same cannot be said for Canadian Pacific Railway, however. Fool contributor Kay Ng has no position in any of the stocks mentioned. David Gardner owns shares of Canadian National Railway. The Motley Fool owns shares of Canadian National Railway. CN is a recommendation of Stock Advisor Canada.